Every little princess loves a wedding — the fairytale romance; the fabulous traditions; the dance floor where the party gets going. Weddings also offer a wonderful opportunity for your angel to dress up to the nines and don her favourite formal wedding wear and occasion dresses. But what is the best formal wear for little wedding guests? If your starlet is taking centre stage as a flower girl or forming part of the bridal party as a bridesmaid, check out our blogs specifically for them, but if your little girl is attending a wedding as a guest, this blog is for you. 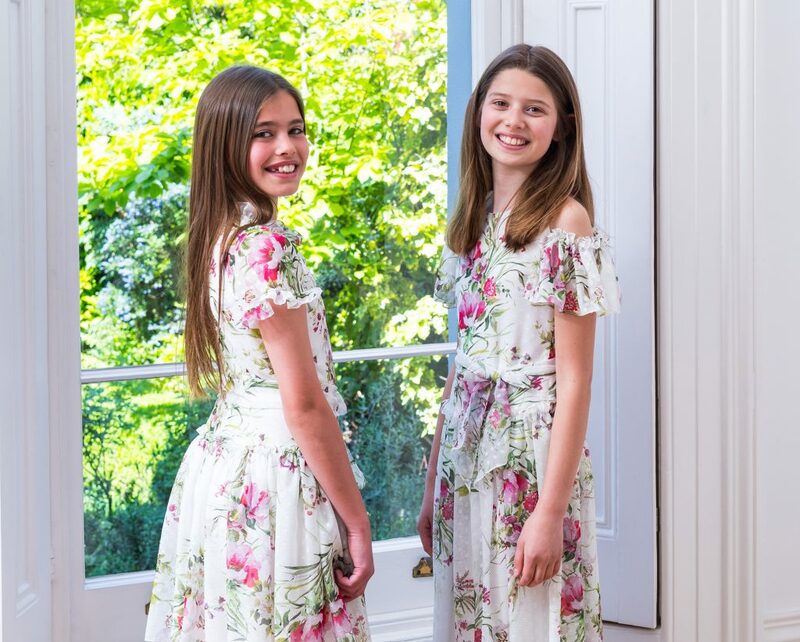 Here are our two favourite looks in children’s occasion wear perfect for spring weddings. Spring and floral prints go together like, well, spring and flowers. As the season of blossom and rebirth, spring is the time for luxury dresses in delicate pastel hues and with vibrant flowery flourishes. And what better time to channel the beauty of the season than at a spring wedding? Children’s formal wear at weddings should be fun, playful and romantic without being too garish or over the top — after all, it is the bride’s big day and you don’t want your little starlet to steal her thunder. Florals are not only an elegant nod to the season, but they also complement the floral arrangements at the wedding. To get the look, our royal blue floral deluxe dress is just the ticket. Perfect for formal weddings, this luxury dress offers a vibrant and playful take on seasonal design. Featuring a royal blue and ivory colour palette and floral print, and in a decadent satin finish, your little girl is sure to feel every inch the wedding party princess. We love the timeless fit-and-flare silhouette, elegant gathered waist and front bodice decorated with ruffles and jewel accents, and we’re sure your little one will too. For little movers and shakers, our ivory, pink and yellow floral swing dress is a perfect choice — ideal for twisting and turning on the dance floor. With a drop waist and a modern swing silhouette, this luxury occasion dress is beautifully embroidered from head to toe. Available in a multi-tone pastel colour and featuring an enchanting floral patterning, it delivers glamorous couture appeal and is perfect for a formal spring wedding. This spring, children’s fashion catwalks are full of simple statement dresses in block colours and minimalist designs, and we think these dresses make fabulous wedding guest dresses for fashion-forward girls looking to make a sartorial impression. Simple yet sensational, they’re particularly well suited to growing girls and elegant teens. Our rose pink bow birthday dress is perfectly polished for a soft feminine look and captures the essence of high-fashion minimalism and David Charles craftsmanship. Exclusive to David Charles, the rose pink colourway and quilted mesh fabric pay homage to the romance of weddings, while the flared skater silhouette and ruffle shoulder pleats put a thoroughly modern twist on the traditional ball gown. To capture the high glamour and sophistication of the French Riviera, you can’t go wrong with our navy and ivory skater dress. This two-tone statement gown in contrasting navy and ivory lends a modern and elegant take on the colour block trend and is the perfect choice for formal weddings. There’s no occasion quite like a wedding for your little girl to get dolled up in her finest frock. Browse our full collection of luxury designer spring dresses for girls and get your little angel the perfect wedding guest dress this season.